Sites with quality content got minor benefits but not a lot. Sites having links from ranked pages has the maximum advantage. Site age not a thing that it followed. It is still gradually rolling so probably something that can become a part of real-time Algo but it’s an assumption in the basis of continuous dance in rankings. 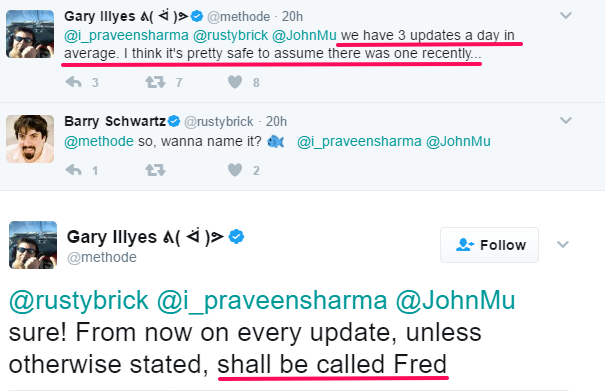 What should you do about ‘Google Fred‘? Here are public sample sites that were potentially hit by Fred. I have a content website and I use 1 affiliate link in each page. I took a hit with the Google Fred update on almost all my branded 1 word queries. My keyword density was 4% (due to the menu’s in WordPress), I removed them and I’m now down to 2.5%. I will continue to work to get it down to 1%. My question is… How long does it take to see changes? And also… Besides kw density links are still important. How do I get quality backlinks? (this is a serious question for all the wise people in this thread ? Fred was not related to onsite densities. Fred was a Penguin style update, not a Panda style one. And if you are asking where to get quality links, then I believe we already know why your site got hit. And quality links, well, you either build them yourself or you try to get them. Build you own PBNs, do an outreach for guest posts or buy some (at your own risk) PBN links here in the marketplace.